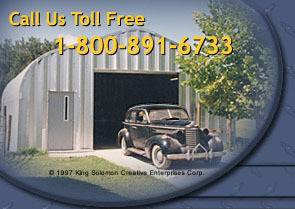 Sometimes having a roof overhead is all you need, in which case an American Steel Span steel carport can fit the bill. The roof/sidewall panels on all American Steel Span metal carports carry a rust-through warranty from the steel mill and each metal carport is manufactured to ASTM International and ASCE standards with a minimum yield of 55 ksi. The panel overlaps on these steel carports are 9" and two rows of bolts are used to secure the panels. That 9" overlap is smooth with no crimps and it fits snug with no caulking required on your metal carport. How quickly can American Steel Span metal carports be erected? Your metal carport can be up and ready for use in a matter of days without the need for special tools or expensive equipment. There is no better solution than a steel carport to shelter your motor home, boat, motorcycle or any of your valuable recreational investments and keep them out of the weather.